All possums in Australia are a protected species, when they move into the roof area of your home they can cause disruption with their goings and comings at all hours of the night. Urine stains from possum pee on your ceiling does tend to look a little unsightly. We don’t paint out the stains on your ceiling, but Australian Feral Management does offer a full possum trapping and proofing service as we are licensed to do so by the National Parks & Wildlife Service. 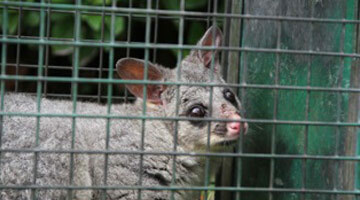 Possums received their name in 1770 from Captain Cook’s botanist Sir Joseph Banks. He described an Australian common ringtail possum as “an animal of the Opossum tribe” based on their similar appearance to the American Opossum. However, they are not closely related biologically. They are separated by 2 continents and 70+ million years. The possums are small to mid-sized, nocturnal, omnivorous, mostly arboreal and generally brown or grey. In the Australian ecosystem their place is roughly similar to squirrels in the northern hemisphere. The 1st toe on hind feet is opposable, and the 2nd and 3rd toes are fused except for claws at the tip used for grooming.